Have you been thinking about trying Baby Led Weaning? The best way to get started is making sure you’re prepared with these important baby led weaning must haves! Now, the beauty of baby-led weaning is that your “must haves” list is relatively small. 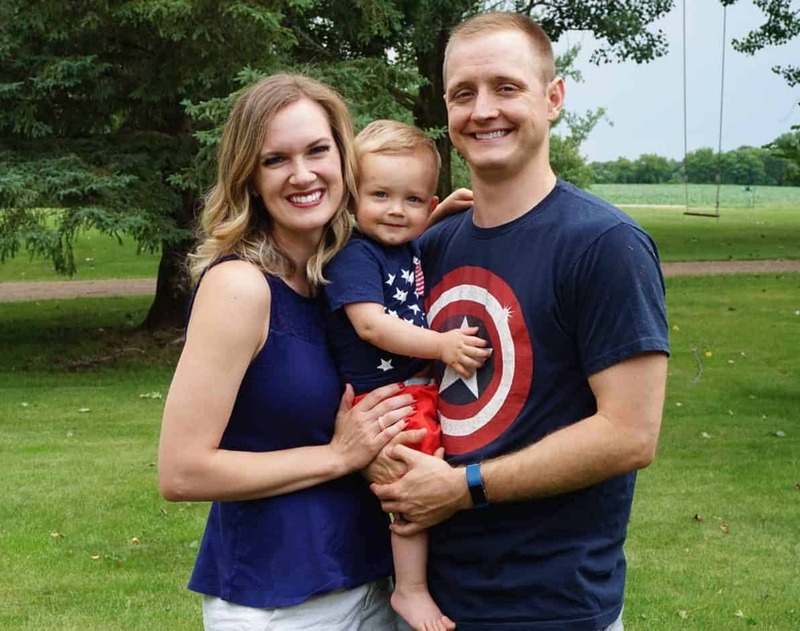 You really only need your baby and the healthy food you’re going to feed them. Easy, right? However, there are still a few products that will make your baby led weaning experience so much easier. 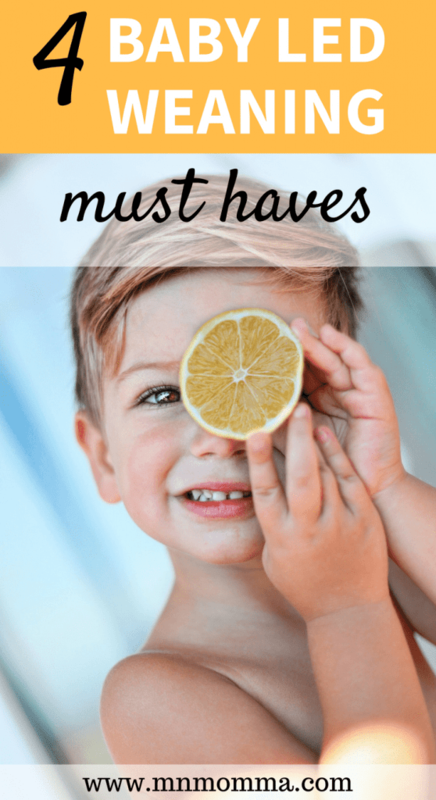 So here’s my list of baby led weaning must haves (aka “really nice things to have”) and why these products quickly became our favorites! One of the first steps to Baby Led Weaning is knowing what you’re doing. I HIGHLY suggest getting a great baby led weaning book to use as a resource. This book gives you ALL the answers you need to your baby led weaning questions, is a short read, and a really reasonable price. Whether you’re deciding if BLW is right for you or if you’ve already started and have questions – you won’t regret having this book on hand! You know all those padded, beautiful, expensive high chairs? When it comes to baby led weaning, it’s pretty simple. They may look pretty in your dining room, but once baby led weaning starts you’re going to want something easy to clean. Trust me, your baby won’t miss that padding, and you’ll love how easy to clean a plastic high chair is. This is definitely a baby led weaning must have. My personal favorite high chair, and the one we own, is the Fisher-Price Healthy Care Deluxe Booster Seat. This seat attaches to most chairs, is affordable, easy to clean, and easy to take with you. If you’re looking for a seat that has the option for longer legs – check out the Ingenuity Smartclean Trio 3-in-1 High Chair. I love that it’s another super easy to clean chair with a modern look. An added benefit to both of these baby led weaning high chairs is the removable food tray. I love being able to prep our baby’s food on his tray (and take it away when he’s done), while he is still safe in his seat with the original tray latched. These are by far my favorite bibs for little ones. They are absolutely a baby led weaning must have – you’re going to love them! Your little one is likely going to drop some food while learning how to eat on his/her own. The “big mouth” catches all the food and helps with clean up (or getting a second chance at some lost favorites), while the snaps make washing the bibs a breeze. We love these bibs so much, we have them stored at each grandparents’ house as well! Another baby led weaning bib we love is the Bumkins Waterproof Sleeved Bib. This one is great for when foods are really juicy and messy, and you really don’t want to ruin those cute clothes you put your little one in. We sent this one to daycare for our little boy! 4. Drop Cloth – the mess saver. If the idea of a baby led weaning mess worries you, there’s a great, easy solution. Grab a cheap, paint drop cloth that you can put under your baby’s high chair. Once your little one is finished, you just pick up the plastic, shake it out into the garbage, and hide it away until next time. Easy! Don’t let the mess deter you – baby lead weaning is an amazing skill for your little one. They’ll be learning and improving in no time at all! I’m hoping you’ll love these products and consider them in your top list of “baby led weaning must haves”. 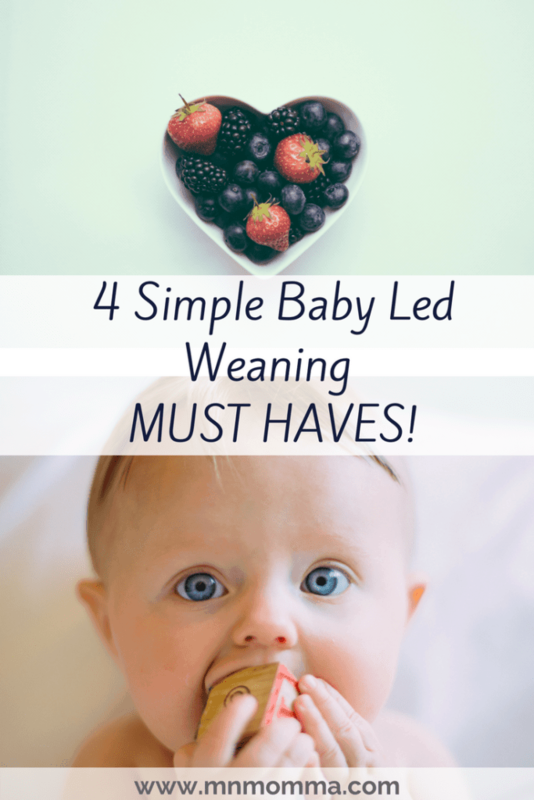 These baby led weaning must haves are just the start of your baby led weaning journey. Trust me, it’s a fun and amazing one! If you’re planning to send your little one to daycare, you don’t want to miss this post on how to do baby led weaning at daycare. 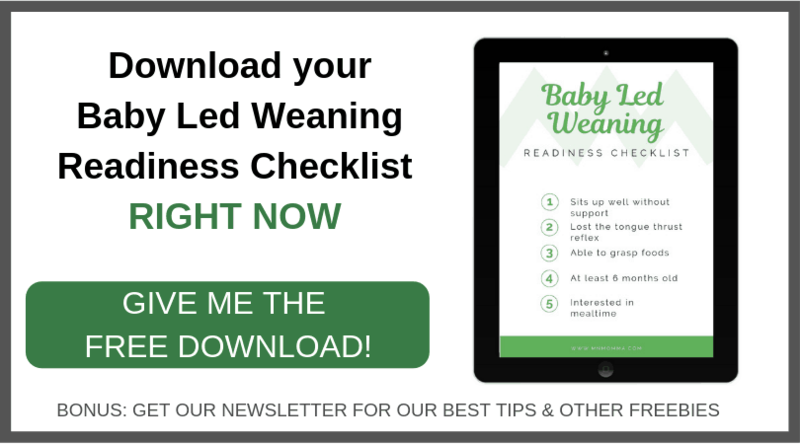 Bonus item: Grab the Baby Led Weaning Quick Guide for $5 today. This affordable guide will help you through the first few months with new foods to try and instructions on how to prepare meals. It’s a great supplement to the other BLW resources!